Have you always wanted to experience the tolt? Or, maybe you’ve been thinking about an Icelandic, but want to try one for yourself. Or, perhaps you are new to riding altogether and want to learn on sane and friendly horses in a comfortable and relaxed atmosphere. Or, are you already riding Icelandics and want to improve your tolt seat? Then Sand Meadow Farm is the place for you! Steve is now offering riding lessons on a limited basis on our steady and smooth Icelandic horses. 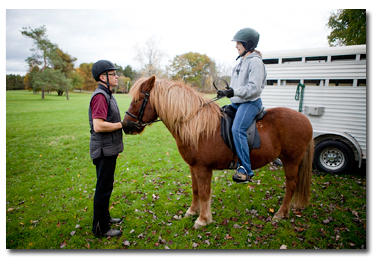 Steve is a patient and fun teacher of all ages and levels whether you are just starting out, or have been riding for years. Lessons are available in the ring, or for those that are ready, out on some of the beautiful trails around the farm. For more information on lessons please contact us.